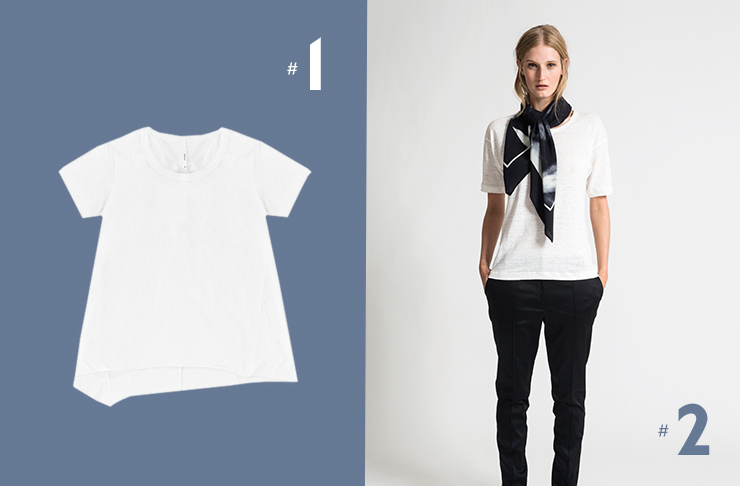 A plain white t-shirt is a blank canvas that is the ultimate wardrobe staple, possessing superhuman powers. Whether teamed with denim cutoffs and sneakers, layered under a shift dress for 90’s grunge vibes or tucked into suit pants with stilettos for effortless glam, the white t-shirt can do it all. 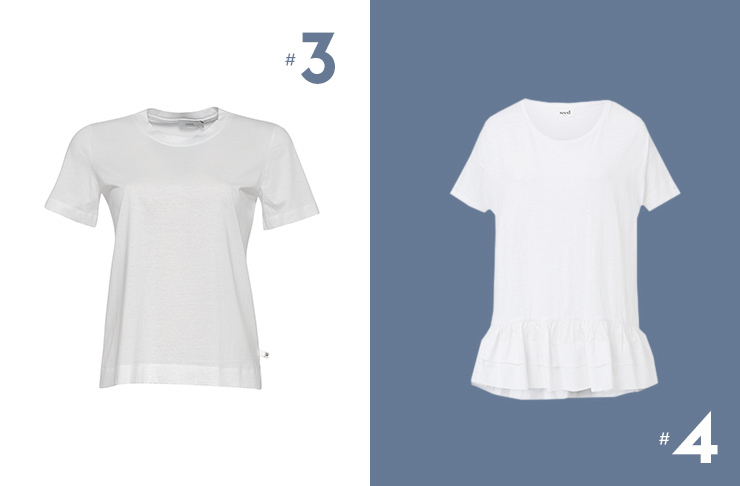 Women everywhere love the essential white t-shirt and so here are our essential tips for finding one, and where you can buy our top picks. Work out exactly what you’ll be wearing it for. If you’re merely painting the fence or doing the school run, go cheap and cheerful. If you’re wanting something to fit into your capsule wardrobe, spend a little more and look after it! Look carefully at the fabric—closer weaved and a thicker material is more likely to last rather than something more lightweight. Have fun with it! However easy it is to throw on with jeans, why not team it with bold prints on the bottom half for a serious style savvy mix up? If you can’t tear yourself away from your trusted skinnies, add a red lip, statement accessories and killer shoes for the ultimate off-duty model look! Be ready to let it go. Sometimes stains get the better off us and keeping a crisp white t-shirt white is a hard task. The beauty of this staple is that they are easy to come by and there are so many variations on the classic, that moving on can be fun! Taking the place of quantity over quality, Commoners are the masters of elevated and top-of-the-range basics. 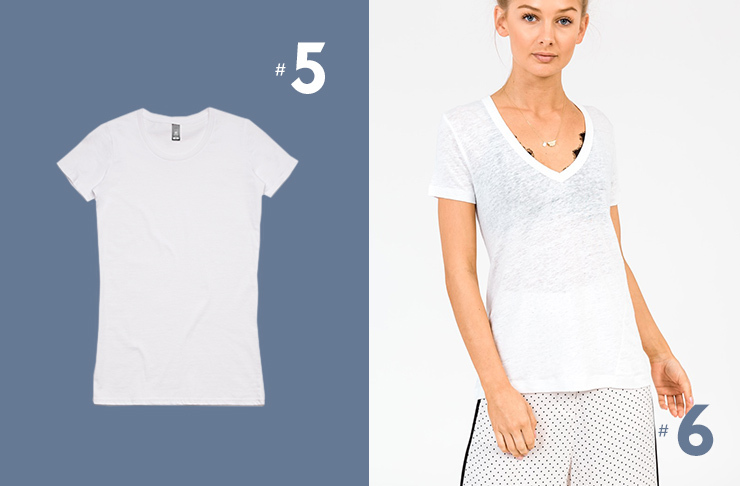 Giving our much-loved wardrobe necessity a modern twist, Commoners women’s white basic t-shirt features a raw asymmetric hem and a relaxed, yet flattering, fit. For the ultimate throw-on and go-to outfit, team this bad boy with slouchy boyfriend jeans, sandals and trusted sunnies for effortless cool-girl style. With an emphasis on all things simple and understated, Juliette Hogan’s clothing is far from boring. Without feeling the need to overcomplicate from her expertly crafted garments, she brings together a perfect marriage of masculine-inspired feminine pieces. Take the Ronnie T white t-shirt, for example. Exuding nothing but style and sophistication, this linen top is sure to last the test of time. Take note—you will not want to eat your spaghetti bolognese in this one! Liam is also hot on our wish list, with their signature classic styles and timeless pieces. With an emphasis on all things ‘closet essential’, it comes at no surprise that their Every Day T-Shirt made this list. And, with a title like that, we trust that we can wear it every damn day. Keeping it plain and simple, this round-necked number is the perfect piece to rock day and night. We’re loving tucking it into a pair of tailored and patterned cigarette pants with chunky jewellery galore for ultimate girl boss sass. Whoever thinks that a white t-shirt is boring needs to get themselves to Seed. With an exaggerated, woven ruffle hem detailing and a simple scoop neck, this is the white t-shirt like you’ve never seen it before. With such a simple and on-trend twist to a classic, popping on this white t-shirt will make everyday dressing ever-so easy and chic. For easy styling, team Seed’s Slubby Frill Tee with white, cropped jeans, statement coloured boots and a denim jacket slung over the shoulder. Proudly wearing their crown as King of the T, AS Colour continue to churn out their great selection of closet basics to fashionistas everywhere. Whether you’re after an everyday crew neck in every colour of the rainbow, we simply can’t go past their plain and simple white version. Going by the name, Wafer Tee, this slim fit go-to features slight neck ribbing and a lightweight feel for easy, effortless day-to-day wearing. With a fantastic selection of international and Kiwi born brands, Superette stocks desirable and lust-worthy pieces for your shopping pleasure. Our eyes are only on the Brooklyn Tee from Jac + Jack, for all of our white t-shirt needs. Incredibly soft and with just the right amount of sheer, transitioning from day to night has never been easier. Simply team it over a lacey bralette, pop on a pair of chic heels and a leather jacket, and you’re good to go, girl!